This interesting name is of Medieval English origin and is a dialectal variant of Ridgewell, a locational name from a place so called in Essex. The derivation is from the Old English pre 7th Century 'hreod', reed, and 'wella', a well or a stream, thus a reedy stream. 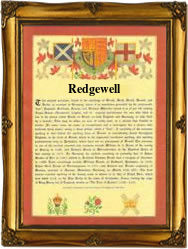 Ridgewell is first recorded in the Domesday Book of 1086 and appears as 'Rideuvella' in the Charter Rolls of 1245 as 'Rodewell', and in the Hundred Rolls of 1245 as 'Rodewell', and in the Hundred Rolls of 1274 as 'Redeswell'. During the Middle Ages, when it became more common for people to migrate from their birthplace to seek work elsewhere, they often used the village name as a means of identification, thus resulting in a wide dispersal of the name. Amongst the early recordings in Essex are John Redgewell, christened on April 9th 1599, and Anne Regewell, christened on August 23rd 1635, both at Toppesfield. The first recorded spelling of the family name is shown to be that of Thomas de Redeswell, which was dated 1281, Feet of Fines, Essex, during the reign of King Edward 1, 'The Hammer of the Scots', 1272 - 1307. Surnames became necessary when governments introduced personal taxation. In England this was known as Poll Tax. Throughout the centuries, surnames in every country have continued to "develop" often leading to astonishing variants of the original spelling.